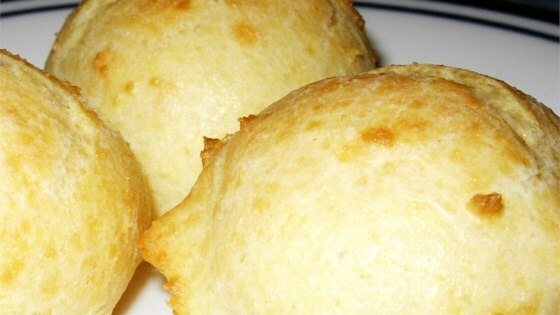 "These are good, very cheesy rolls that are delicious as a warm appetizer. My boyfriend and I make them about 2 to 4 times a month. We love them. I recommend doubling the recipe if serving more than 2 or 3 people." Preheat oven to 375 degrees F (190 degrees C). Lightly grease a medium baking sheet. In a medium saucepan, bring milk and margarine to boil over medium high heat. Stir in flour and reduce heat to low. Vigorously stir until thick enough to form into a ball. Remove from heat. Beat eggs into the mixture until smooth. Stir in Parmesan cheese. Drop the dough by rounded teaspoonfuls onto the prepared baking sheet. Bake in the preheated oven 15 minutes, or until puffed and golden brown. Serve warm with warmed marinara sauce for dipping.